People have lived in the Columbia Basin for more than 10,000 years. They have seen changes to the land and rivers as more people from diverse backgrounds have moved into the Basin, established permanent settlements in the valley bottoms and explored the mountains for mineral and timber resources. Learn more about the Columbia Basin First Nations in the segments below. Traditional Ktunaxa lands cover the southeastern corner of BC, including the lower Kootenay Lake area, and extend into Alberta, Montana, Washington and Idaho. The Ktunaxa language is distinct and is not related to or based on any other language in the world. The Ktunaxa traditionally moved throughout the region based on the seasons, taking advantage of the availability of food and ease of travel. Part of the large Interior Salish tribe, the Secwepemc have a rich oral tradition that once shared important information like seasonal transportation routes, hunting grounds and fruitful gathering locations from generation to generation. Hunting ungulates and fishing for salmon were important sources of food. Also known as Lakes or Arrow Lakes, the name means People of the Place of the Bull Trout. The bull trout was found throughout the Sinixt territory, which centred on the Upper and Lower Arrow Lakes and stretched east to Slocan Valley and south into Washington State following the Columbia River. 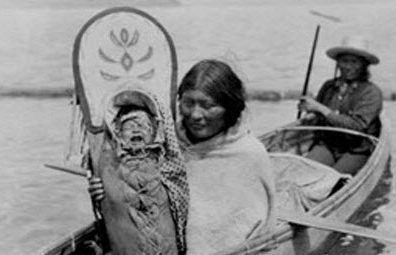 The Sinixt were declared extinct by the Canadian Department of Indian Affairs in 1956, following the death of Annie Joseph, the last “official” Sinixt in Canada. Many other Sinixt are living on the Colville Indian Reservation in Washington State, and on First Nation reserves in BC’s Okanagan and Kootenay regions. 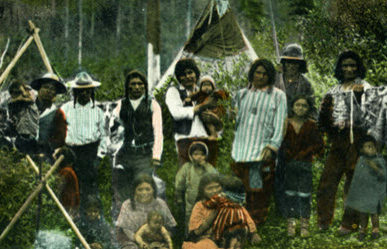 The traditional name for the Okanagan people is Syilx. The Syilx language is Nsyilxcen, a dialect that is common among the Interior Salish Tribes. The Syilx cover a large territory in the southern interior of British Columbia, stretching from the Nicola Valley to Kootenay Lake and from Mica Creek to south of Chelan in Washington State. Syilx histories, placenames and stories are full of teachings and images of Sinklip (Coyote) who was sent by the creator to help the Syilx survive on this land. Most First Nations activities-hunting, gathering fishing and preparing food for storage-were seasonal, followed food supplies and were dependent in part of the availability of transportation routes. Learn more about how the Columbia Basin First Nations hunted, fished and traveled around the Basin in the segments below. Ungulates were the most useful animals, with deer being the most important food source. All parts of the animal were used, including hides, antlers and bones. Other species hunted included caribou, elk, moose, mountain sheep and bear. Fish was a staple for many people living in the Basin. The Sinixt were able to catch ocean-going salmon – Chinook and Coho – at Kettle Falls on the Columbia River in Washington, using spears and basket traps. This was before construction of the Grand Coulee Dam, completed in 1941, blocked migration of salmon further up the Columbia. Basket traps were used in smaller streams. On lakes, long-baited lines with floats and sinkers were used, along with large nets strung between two canoes, or trolling lines. 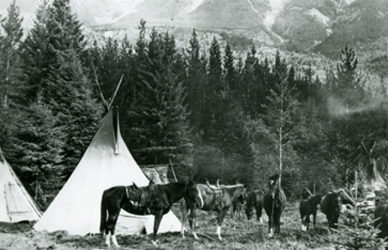 The Ktunaxa used traps or weirs and fished for trout, bull trout, white fish and sturgeon. In times of great need, peamouth, Columbia River Chum or squawfish were caught. First Nations gathered seasonal berries, bulbs, fresh greens, tree sap and bark in specific seasons in specific locations, creating established migratory paths that followed the food supply. Berries were collected and often dried or stored in fat, usually bear fat. The huckleberry was one of the most important food sources and continues to be an important staple. The local First Nations’ diet also included raspberries, Saskatoon berries, chokecherries, wild rosehips, salmon berries, soopolallie, blue elderberry, wild strawberries, Oregon-grape and high brush cranberry. Kinnikinnick was used for smoking. Bulbs were harvested from many species from the Lily family, including tiger lily, nodding onion, yellow glacier lily and wood lily. Many plants of the lily family are poisonous, so great care was taken in the collection of bulbs and stems. Fresh greens, collected in spring, were a welcome addition to First Nations’ diets after a winter of dried and preserved food. Greens included wild carrots, wild potatoes (western spring beauty), cow parsnip and selected fiddleheads from lady ferns and spiny wood ferns. Trees provided nuts from cones in the fall, the inner bark (cambium) was harvested in the spring when the sap was running and gum was made from foliage and bark throughout the year. 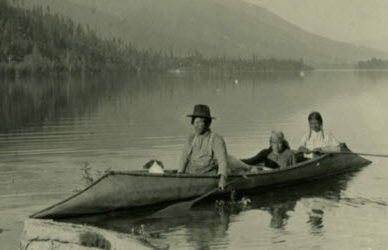 The sturgeon-nosed canoe is unique to the Basin. With a pointed stern and bow that sit flat on the water, the canoe allowed safe travel in unpredictable waves on large lakes and was strong enough in the bow to sustain impacts in rushing creeks and rivers. The canoes were made of white pine bark, sewn together with the roots of western red cedar. The ribs were made of willow and sealed with white pine resin.